The Sanctuary in Ogbourne St.George is praised for spacious rooms and the quality of the meals. Local produce is used when available, from their garden or local suppliers, with eggs from their own hens. It has three spacious rooms with good facilities. Children and dogs are very welcome as well. Visit Marlborough Wiltshire and the surrounding villages and stay in bed and breakfast, hotel or holiday home accommodation provided by BedPosts members. Marlborough is a town positioned on the River Kennet in Wiltshire. There is a twice weekly market and a jazz festival every summer. There is a 17th Century Silk Merchant's House open to the public in the high street. 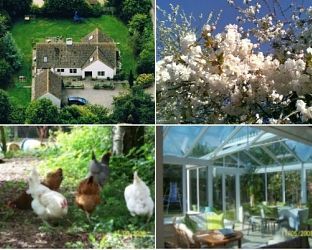 If you seek accommodation near Marlborough in Wiltshire you have come to the website of a “club” of providers who offer affordable quality accommodation around UK in hotels, bed and breakfasts, guesthouses, inns, and restaurants plus self-catering cottages and apartments .